Sometimes there are apps that make their way into your digital toolbag as if there was always a spot for them and yo just didn’t know it. 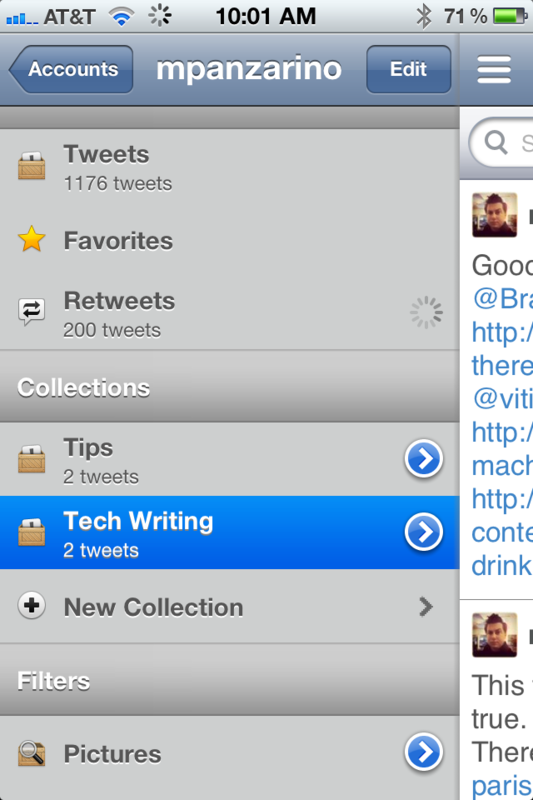 Tweet Library is one of those apps for me, as it should be for anyone who uses Twitter heavily for work or play. At its heart, Tweet Library [App Store, $9.99] is an app that keeps a local cache of all of your Tweets, mentions and retweets on your iDevice. This allows you to do super cool stuff like looking backwards more than 3200 tweets (the maximum Twitter allows you to see), creating collections and lists and searching through your 140-character bits of wisdom with awesome speed. Want to find that one tweet you sent out about that one thing that one time months ago? Good luck finding it on Twitter. With Tweet Library, you’ll be checking it out within seconds. With this latest version of Tweet Library, developer Manton Reece has added some great new bits of functionality to an app that I already use incessantly, and made it universal so that I can now keep my archive on both the iPhone and iPad. Besides the addition of an iPhone version of the client, Tweet Library now also publishes to Storify, as well as its own site. This is great because you can build an archive of tweets to craft a story quicker on the device than you can on the web. Storify is a great way to codify tweets into a cohesive story, but I’m not a huge fan of the way you have to add individual ingredients. 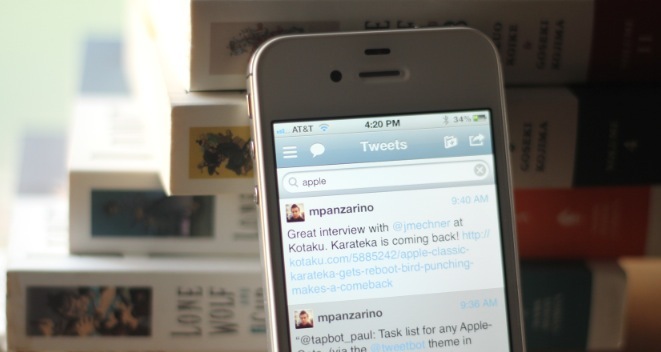 Any tweet can be added to a collection, from your timeline, your archive or mentions. Just enter the copy mode and select one or more tweets, then shoot them over to your bucket of choice. It’s a great way to bundle related tweets together, and much more relaxing and rewarding than a web interface. 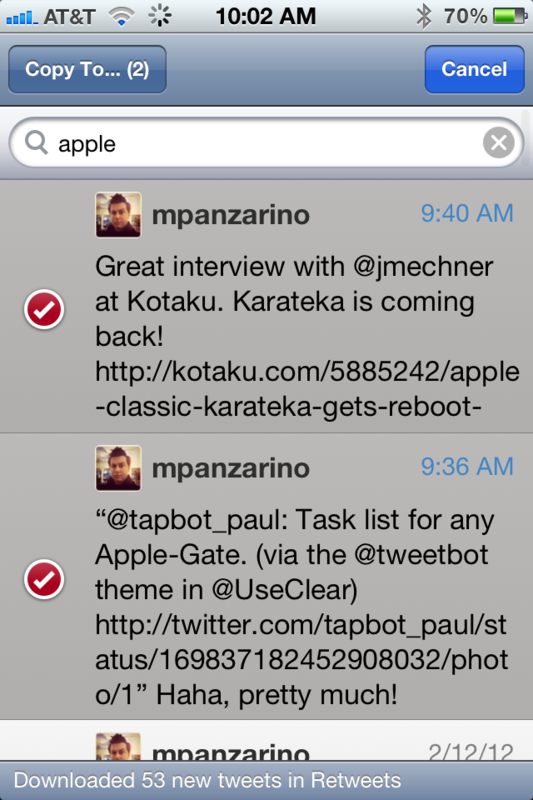 You can also use Tweet Library as a regular Twitter client by creating tweets. 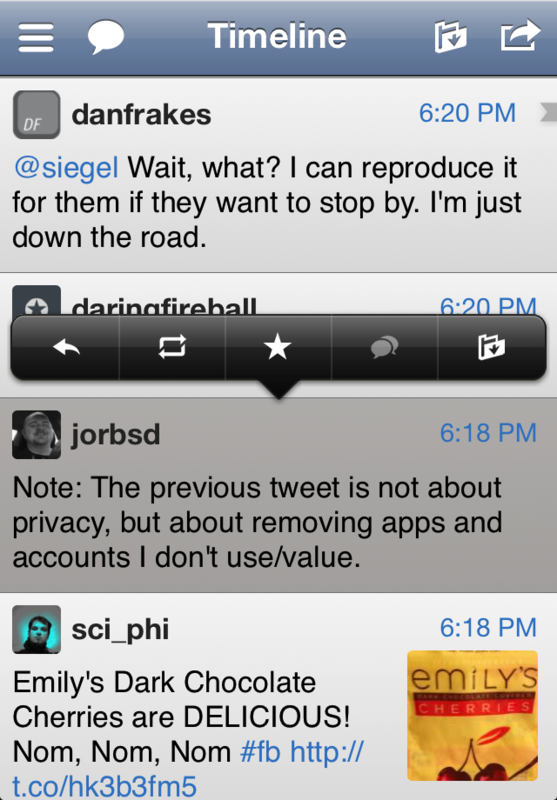 You can also tap and hold a tweet to reply, favorite, retweet or archive a tweet. I’ll be completely honest here, I’ve never even sent a tweet directly from Tweet Library. For me, it’s a way of storing a quickly searchable local archive of my timeline in my pocket. That is its power, and that’s why it has earned a permanent place on my iDevices. If there comes a point at which Twitter gives you access to all of your tweets you’ve ever tweeted, that will be a very nice thing. But even then it is unlikely we’ll see the kind of grouping, sorting and presentation tools that Tweet Library gives you. In the end, Tweet Library is absolutely not an app that everyone who uses Twitter must have. You’re doing yourself a disservice if you spend ten bucks on this thing expecting it to be a regular Twitter client with some extra features. If however, like an increasing segment of people that I know, your life revolves around Twitter and tweets more than you’d care do admit, Tweet Library is absolutely essential.